It’s very easy to take things for granted and Cantonese food is one of those things. 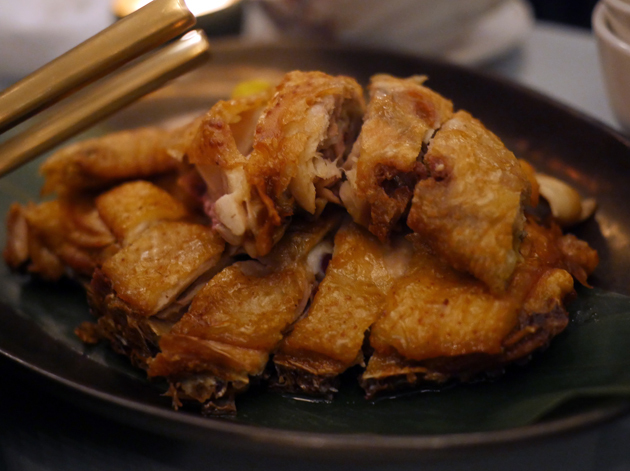 London has been fortunate enough to benefit from some respectable and credible Cantonese cooking for several years now. And yet this venerable style of cooking has fallen out of fashion somewhat as other regional Chinese cuisines have risen to hog the limelight. 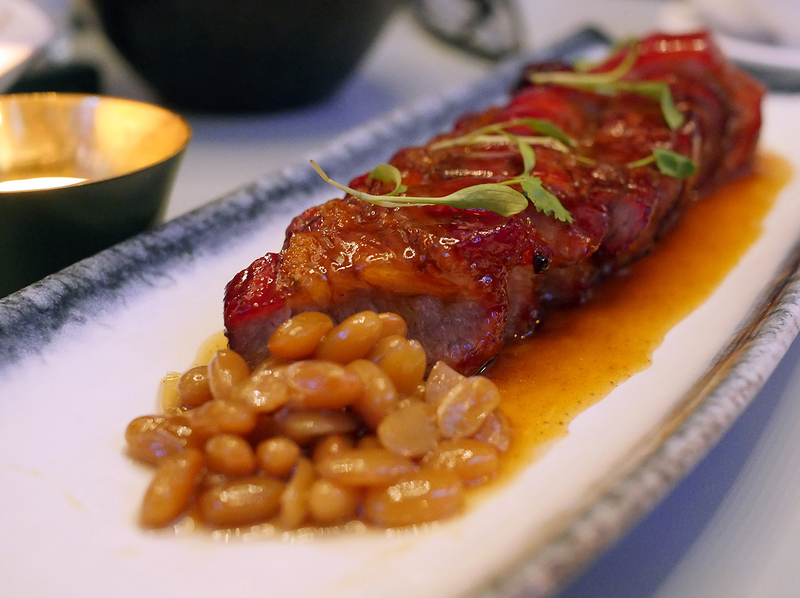 With London’s recent batch of homegrown Cantonese restaurants having fallen into a stupefied funk, the task of reinvigorating our perception of Cantonese food in the capital has fallen to an outside force – Duddell’s, a famed restaurant in Hong Kong. Duddell’s London outpost is set within the premises of the former St. Thomas’ church, mere steps away from London Bridge station and The Shard. While hardly the most opulent or dramatic of London’s churches, the high-ceilinged vaulted interior is still undeniably charismatic and thoughtfully adapted for restaurant use. Duddell’s will undoubtedly get a lot of attention and plaudits purely for the appearance of its premises, but it’s the cooking that’s the real star of the show here. Duddell’s serves a surprisingly small dim sum menu for lunch with an even smaller ‘Symphony’ available as a starter at dinner time. The selection of dumplings in the Symphony were all technically excellent – thin, translucent yet sturdy skins filled with seafood fillings cooked just-so with no cheap pork fat filler shoved in. And yet there’s an overbearing sense of uniformity here. The firm prawns, milky crab and scallops with a crisp and clear aftertaste were all excellent individually. But when taken one after the other, the succession of dumplings as a whole came across as far too samey. Even a mere cameo appearance from another part of the dim sum oeuvre – a taro dumpling, tofu skin roll or turnip cake for example – would’ve added contrast, punctuation and differentiation. Less a symphony and more a leitmotif repeated endlessly. 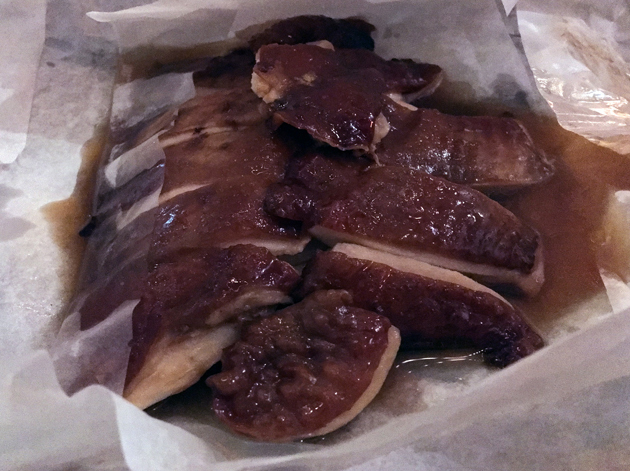 Soya chicken is a common sight at Chinatown’s Cantonese restaurants and, at first glance, Duddell’s rendition doesn’t seem that far removed. The slices of gamey chicken sheathed in taut, slippery skin and perched on a bed of yieldingly tender veg was certainly a step above the chook meat in the West End, but not so much so as to be worth writing home about. The sauce on the side had the appearance of a French-style consommé, but was more akin to a reduction or broth when slurped. When dunked into it, the chicken took on a pleasing and gentle umami. But the sauce took on a whole new life of its own when taken with steamed white rice. There, its umami was far bolder and much more easily noticeable, with a layered sweetness and the distinct hint of star anise that added even more depth. It’s an odd chicken dish where the central attraction isn’t the chicken itself, but the sauce. All-in-all, it’s certainly worth having – even if only once. 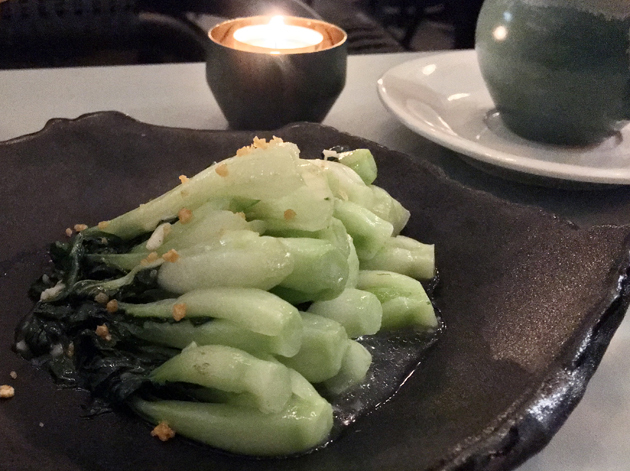 Crisp baby pak choi was made even better by the precise application of garlic in its sticky sauce – boldly moreish, but not at all overpowering. There’s something hypnotic about the way all those stems of pak choi have been stacked. Traditional Cantonese cuisine doesn’t really do desserts in the Western sense. 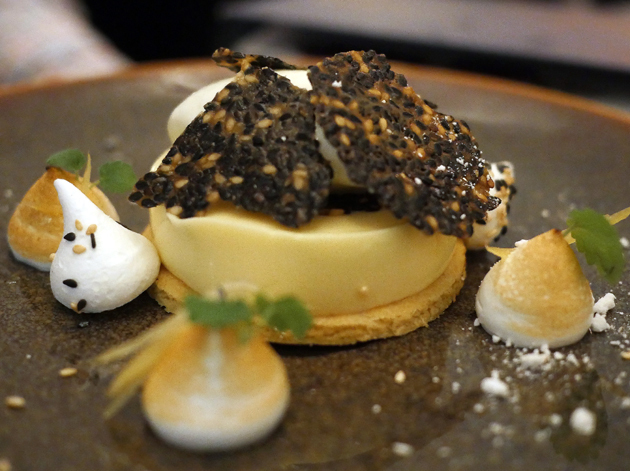 And yet Duddell’s doesn’t attempt to translate the sweets and confections of modern China and Hong Kong, which can be quite strange to the Western palate, opting instead for a selection of initially tame-sounding tarts, puddings and sorbets. The pastry of the macadamia nut delice had little to say for itself, especially when compared to the beauty of the filling. The cream of the tart and extant macademia nuts had a caramelish, cornflake-like sweetness which contrasted well with the dense, musky sweetness of the kumquats. The refreshing, lightly citrusy and palate cleansing sorbet was the perfect finish. 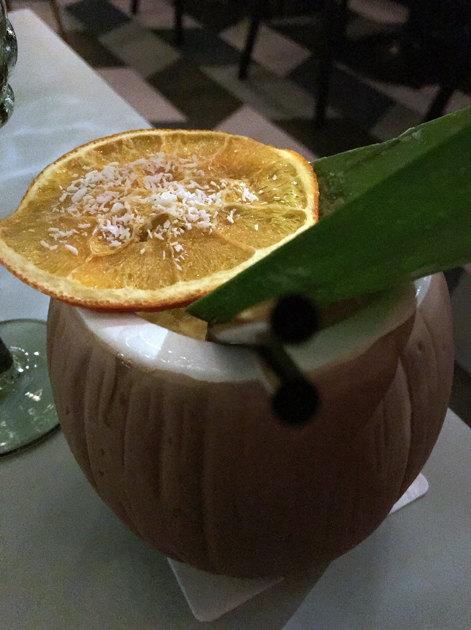 Refreshing coconut tinged with the tannic tang of Jasmine tea proved to be a refreshing drink. The ‘cocopanda’. I’m a sucker for things named after pandas. 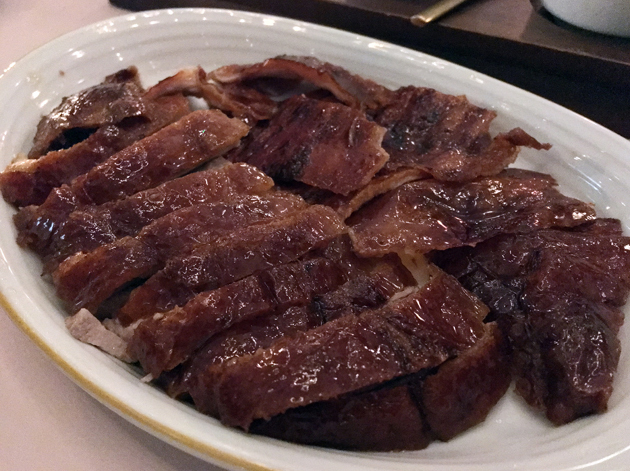 While Duddell’s does serve Cantonese-style roast duck, it’s the Peking duck that gets all the attention and with good reason. 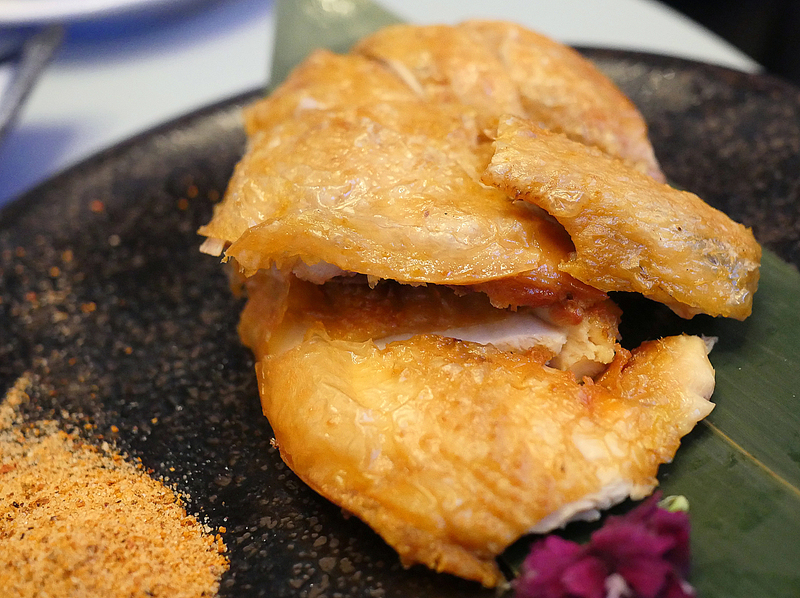 While the skin wasn’t quite crispy enough in places, Duddell’s rendition (available in either half or whole bird portions) was still far better than the version at A. Wong. The skin had a fruity sweetness with a richly fatty underlayer – qualities carried over into the moist and lightly earthy slices of breast meat. 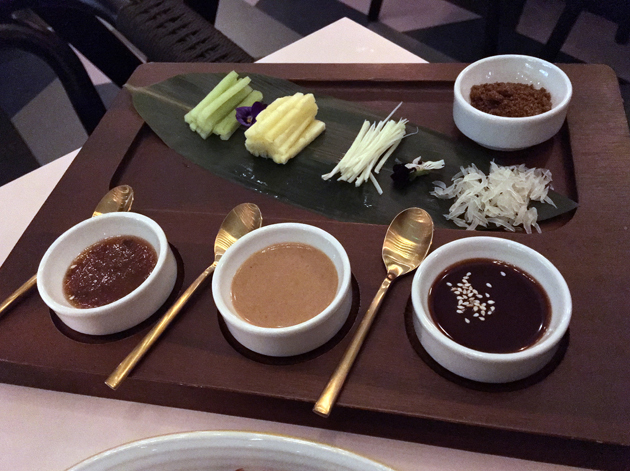 I wasn’t convinced by the fennel salt and more taken by the selection of sauces ranging from sharp tamarind to a mustardish satay-like concoction. The qualities of the duck were arguably lost amidst when taken with all these garnishes, sauces and – most especially – the oddly malty, thick and almost tortilla-like pancakes. A little unbalanced then, but still a fine roast duck dish. The only good duck is a roast duck. The second duck course was arguably just as good the pancake-wielding main deal, albeit in a very different way. 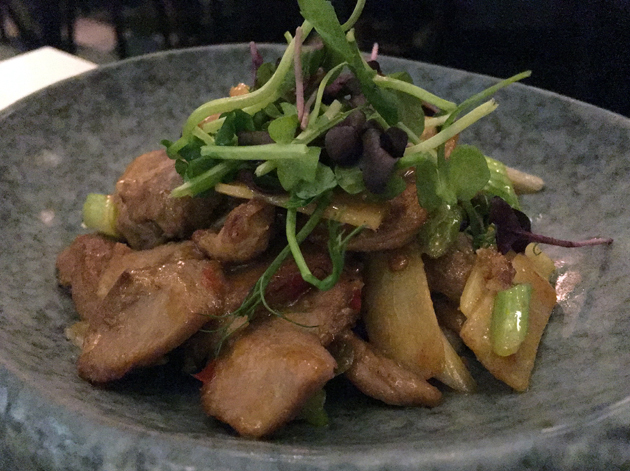 Boldly earthy pieces of duck were stir-fried, glazed in a sticky sauce that imparted an equally strident umami that was balanced out by peppy slices of ginger and spring onion. The calculated equilibrium here was remarkable – bold flavours, but not overpoweringly so, with each element counterbalanced by another. Wok-fried turbot displayed similarly accomplished culinary craftsmanship. 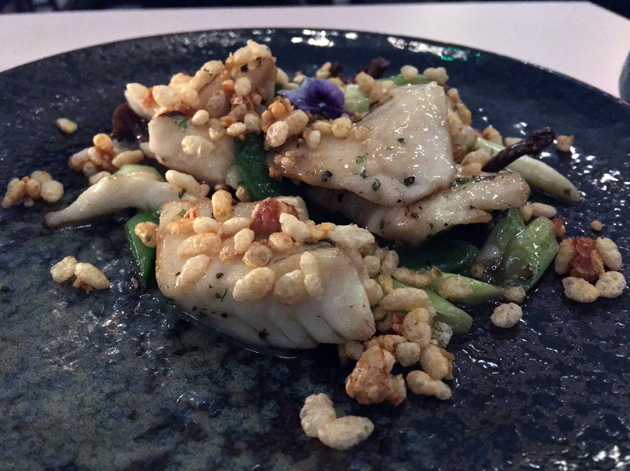 The delicate and milky yet meaty chunks of turbot acted as carriers for the caramelised popcorn-like flavour of the puffed rice. Crisp-textured leafy greens with a clean aftertaste were a contrast, both in terms of texture and flavour, to the earthy umami of the fungus-like mushrooms. The only niggle in what was otherwise an embarrassment of riches was the occasionally chicken-like nature of the fish. I wasn’t expecting much from the creme brûlée, but then this isn’t your French aunties’ creme brûlée. 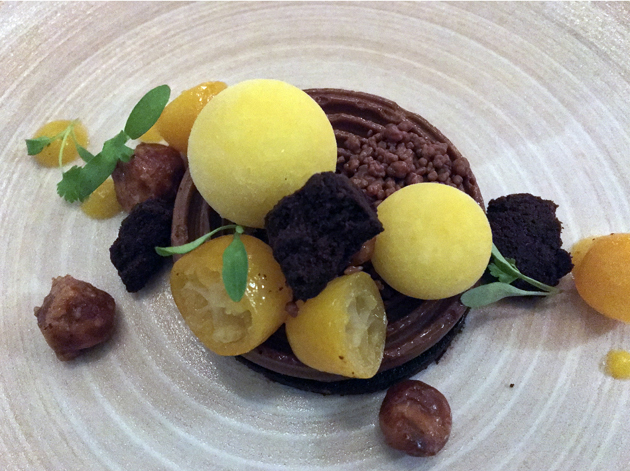 The almost non-existent crust gave way to reveal a richly creamy pudding bursting with the punchy sugary zestiness of candied fruit – qualities emphasised by the similarly strident sorbet. Gingerbread on the side topped with candied fruit and yoghurt was fine, but hardly necessary. While distracting, in the end it didn’t detract from this sublime dessert. To the couple getting it off in the hallway outside the bogs: get a room. Sheesh. Although there were a bunch of other elements in the XO candy, the best thing about this mocktail was the lip-pursingly refreshing taste of sour plums. An acquired taste to be sure, but a top-notch one all the same. Ooops, forgot to take a photo of this one. Sorry folks. Happy Buddha and The Lensman are at their happiest when chowing down on Sri Lankan and Japanese food respectively, but both were still more than happy to accompany me for this third and final meal at Duddell’s. Beef foie gras toast saw relatively creamy morsels of liver (presumably from a cow rather than a goose) slathered in sesame seeds and then perched on small slices of toasted crisp breads. It was all quite underwhelming. If there’s one thing London’s high-end Chinese restaurants really need to stop fussing over, it’s foie gras. 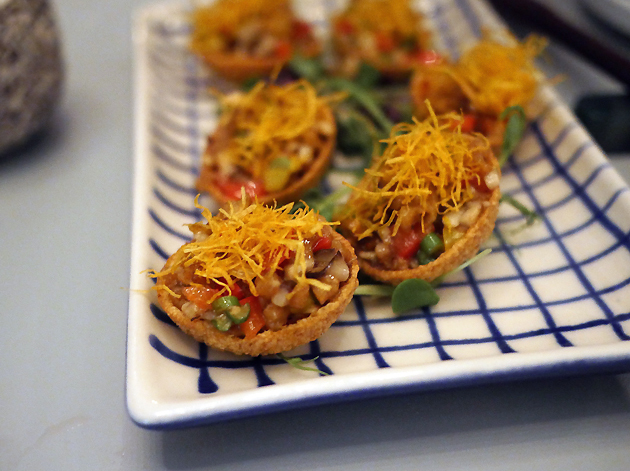 Trying to reinvent or paying homage to sesame prawn toast is a very close second. Neither one ever works. Not the toast of the town. XO beef shin saw thick cubes of bovine flesh served at room temperature and topped with gently spicy and umami blobs of XO sauce. 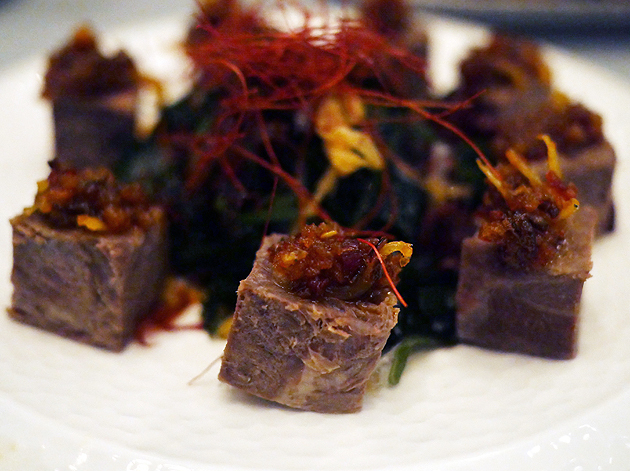 It was somewhat akin to braised beef shank served chilled, a more traditional and usually more satisfying plate of Chinese-style cold cuts, but without the rind of connective tissue that characterises that classic dish. 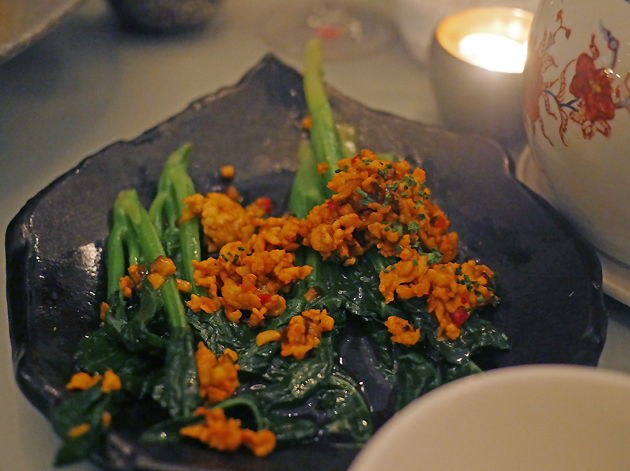 The most successful element, besides the layered XO sauce, had to be the tart and tangy bed of greens. Vegetarian ‘chicken’ plopped vaguely seitan-like pieces of mince in crisp pastry cups. Although not entirely unenjoyable with the vegetarian mince possessing a starchy soy-like taste to it, this starter was ultimately forgettable. 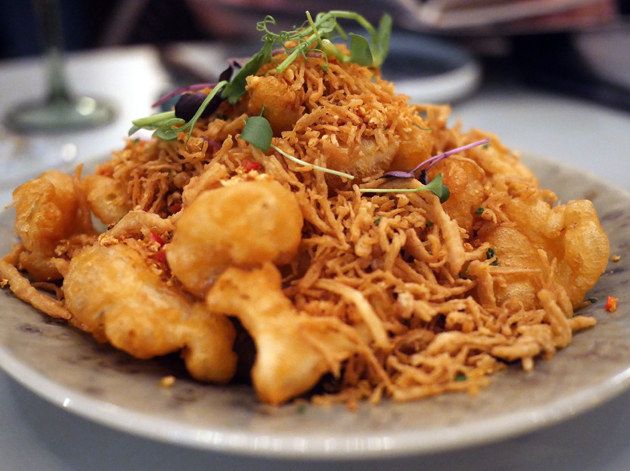 The most well-rounded starter was, quite surprisingly, the salt and pepper deep-fried squid. The batter was delicate and airy with rolls of yieldingly tender just-cooked squid underneath. The nutty and umami scraps were an unexpected bonus. This review’s procrastination was brought to you, in part, by Star Wars. 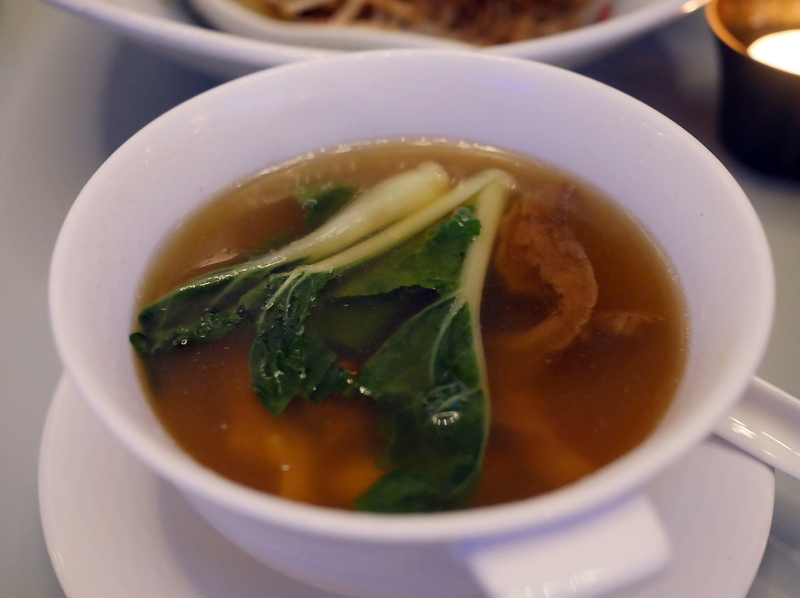 Although billed as a main, the double-boiled soup was starter-sized – especially when shared between three. Nevertheless, it was a strikingly lovely thing that left me weak at the knees. 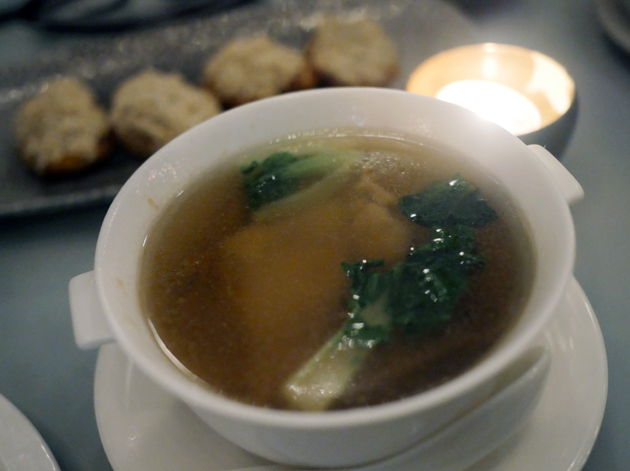 The clarified soup had a delicate, beguilingly lip-smacking umami. Tenderised chicken, whelks, pork and mushrooms were offal-like in their wrinkly tenderness. They were an integral part of this soup – they were not only a textural delight, but biting into each one unleashed more umami that proved to utterly addictive. If there’s one dish that I could eat every day at every meal, then this would be it. One of the best dishes at Duddell’s is also one of the most unassuming. Although the crispy-salted chicken never quite matched the heady heights of the broth accompanying the soya chicken, it was more consistently pleasing. Tender and moist poultry sliced on the bone came topped with a skin remarkable in its almost uniform crispness. The moreishly meaty salt on the side was not only a superlative condiment, but possibly qualifies as a Class A controlled substance too. I just want more. All three of us made short work of the lobster noodles, plucking bouncy and perky knuckles of lobster from the shell. Only the slightly too-soft claws were a disappointment. 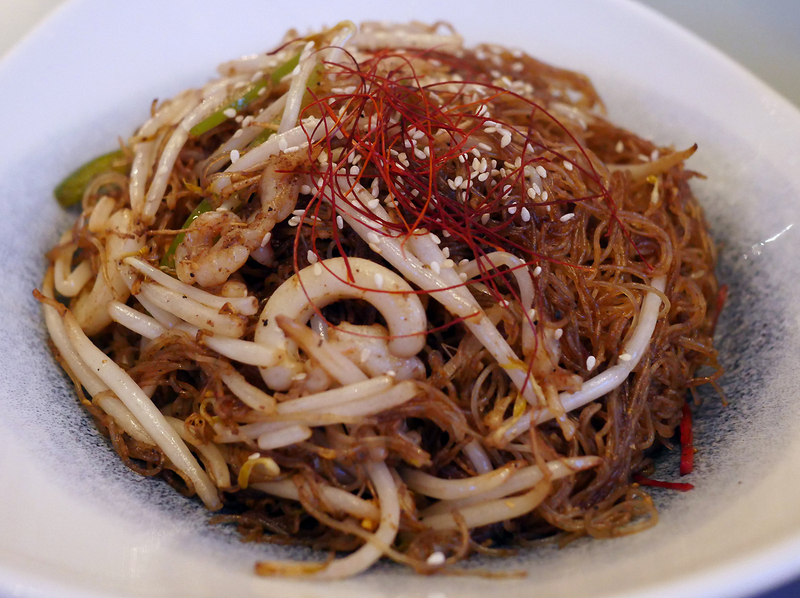 Supple noodles were coated in an immensely pleasurable sauce, sticky with umami and dotted with crisp spring onions and slices of ginger bursting with heat. 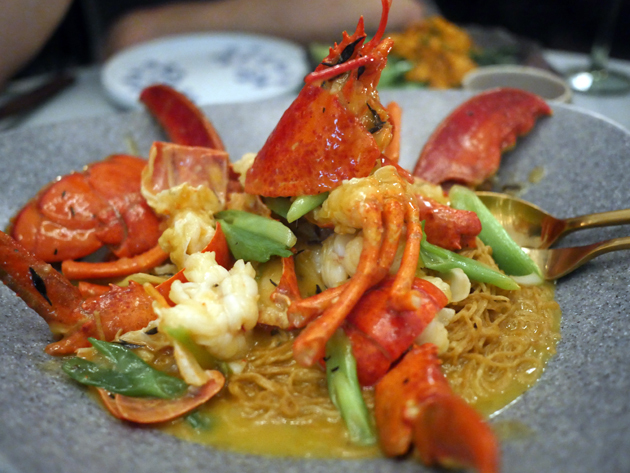 Quite a few Chinese restaurants can crank out a respectable plate of lobster noodles – few can match the superlativeness of Duddell’s admittedly pricier version. 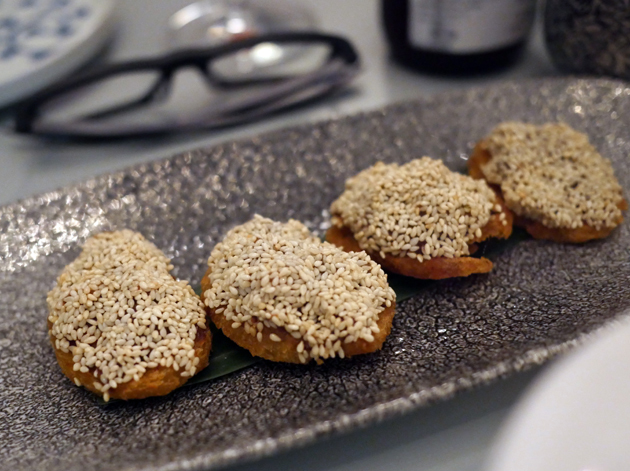 Meaty minced chicken and a lightly umami prawn-based sauce garnished firm and crisp kai lan. Neither were quite as effective as they could’ve been, but this plate of greens arguably didn’t need them as it provided crunchy clean-tasting relief in between bouts of rich chicken and lobster noodles. Although the pastry in Happy Buddha’s yuzu tart didn’t leave much of an impression, the filling punched well above its wispy weight with an insistent zingy zestiness. 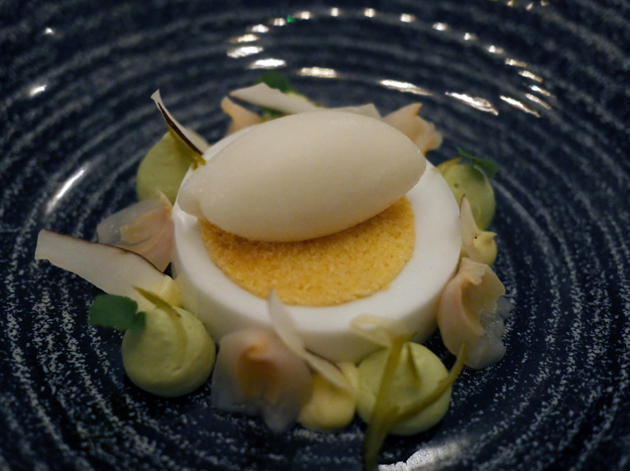 Beneath its oddly egg-like appearance, the coconut and lime panna cotta packed in the distinct creaminess of coconut alongside the sharp tickle of lime in its smooth and light pudding. This one-two punch was emphasised and then neatly swept away by the sorbet with its initial tanginess and clean aftertaste. The Szechuan pepper pineapple wasn’t what I expected at all – not only in its panna cotta-like appearance, but also in the near total absence of discernible Szechuan pepper. Although not nearly as boldly flavoured as the coconut and lime panna cotta, this dessert wasn’t a dud. 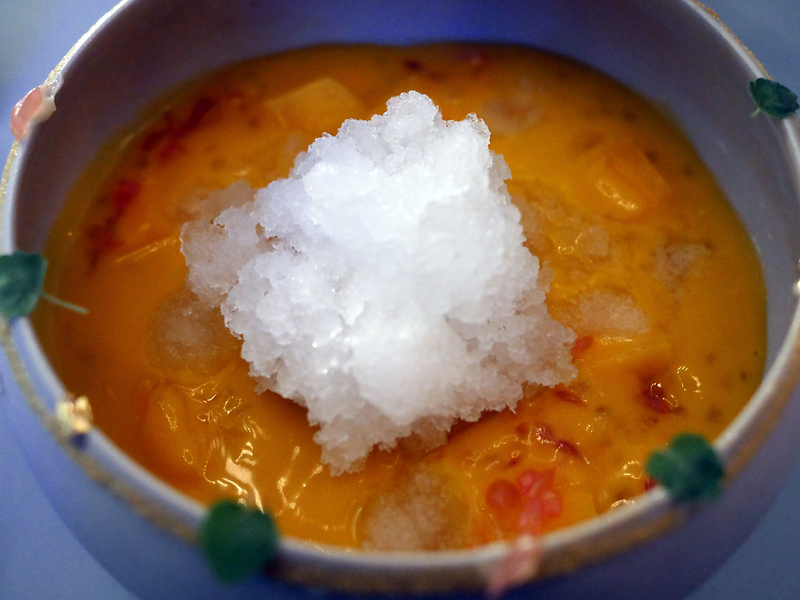 The gentle taste of pineapple in the cream was bolstered by the mildly tangy bits of extant, almost candied fruit and then enhanced again by the modest sharpness of the smooth sorbet. Crisp pastry, evoking a bird’s nest, was fine but what I really wanted were bigger pieces of the eggy waffley biscuits for scooping up the pudding. 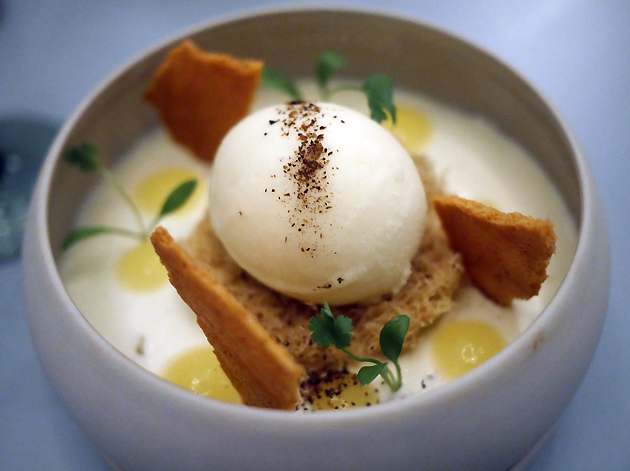 Although the most softly spoken of the three desserts in this final meal, this pineapple pud still managed to evoke enough of the fruit’s essence to be pleasing. After hearing disturbing reports that the quality of Duddell’s food had declined, a return visit was in order – this time with the aid of The Euro Hedgie and Rodan. Apart from a few artworks scattered throughout the apse that were neither here nor there, the most immediately noticeable difference was the service. While still friendly, it wasn’t quite the well-oiled, effortlessly efficient and attentive machine it once had been. There were noticeable delays in placing our orders and having empty dishes cleared away due to long-ish stretches of time where not a single waiter could be found on the dining floor (and the mezzanine was completely empty, so they don’t have that excuse). To be fair this slide in service standards is increasingly common across the capital’s restaurants, but it’s especially egregious at a pricey restaurant like Duddell’s where slick service worthy of the high prices had once been a given. While the noodles in the seafood vermicelli were moreish and supple, the ‘seafood’ component merely seemed to consist of a few curls of tenderised squid. It could well be that there was a bad catch that day. But it’s also highly plausible that this is a sign of corner-cutting. Perhaps the noodles were cooked in a seafood-based stock? Nah, that’s probably just reaching. Whoever came up with the recipe for Duddell’s wagyu beef mapo tofu needs a stern spanking before being packed off back to culinary school for remedial lessons. Adding wagyu beef might make this tofu dish more attractive to wannabe Kanyes, poundshop City boys and other deplorable halfwits, but this nauseatingly shallow wealth signalling was a waste of protein. At best, it added a mere hint of extra richness to the proceedings. But this was only noticeable due to the complete absence of numbing Sichuanese peppercorn in the sauce. 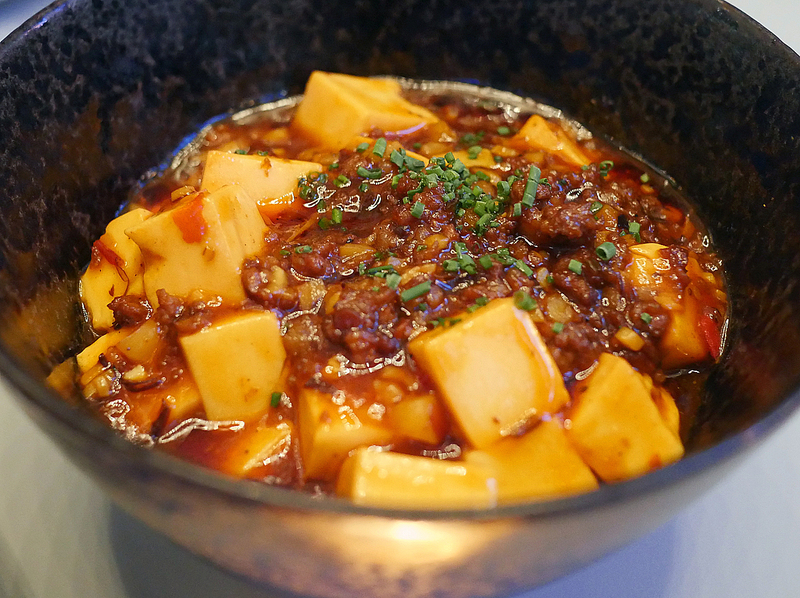 Even the tofu itself was drab, leaving both myself and the Hedgie – an avowed mapo tofu fan – bitterly disappointed. Adding wagyu beef to dishes really is the restaurant equivalent of jumping the shark. Things picked up a bit with the cha siu pork, but only a bit. The dense meat had a subtle unctousness to it, but this was spoiled by the glaze which was too sugary sweet for my liking. The natto-lookalike soya beans might have been intended to offset this, but it wasn’t anywhere potent enough to do so. I really should’ve nudged those soya beans aside for a better photo. Oh well. Crispy salted chicken was respectable, if not as accomplished as it once had been. While far from floppy, the skin wasn’t as evenly, uniformly crisp as it was the first time around. Although served on the bone and reasonably moist, the chook meat itself was an uninteresting affair with even the salt failing to pep things up. It’s not the addictively moreish dish that had captivated me just a few months ago. In an evening hardly short of disappointments, the biggest let down had to be the double boiled soup. While the soup placed before me still had plenty of umami, it wasn’t anywhere as nuanced, sophisticated and bone-shudderingly delightful as it once was. The ‘mango cream’ dessert was the classic mixture of sago, grapefruit and mango with the addition of a set cream made from both fruits. Except here, it was mostly cheap and cheerful grapefruit topped with shaved ice for whatever reason. I love the tangy sourness of grapefruit, but it was the sour taste of the corner cutting that lingered in my mouth long afterwards. The yuzu pot, of all things, was the star of the evening. 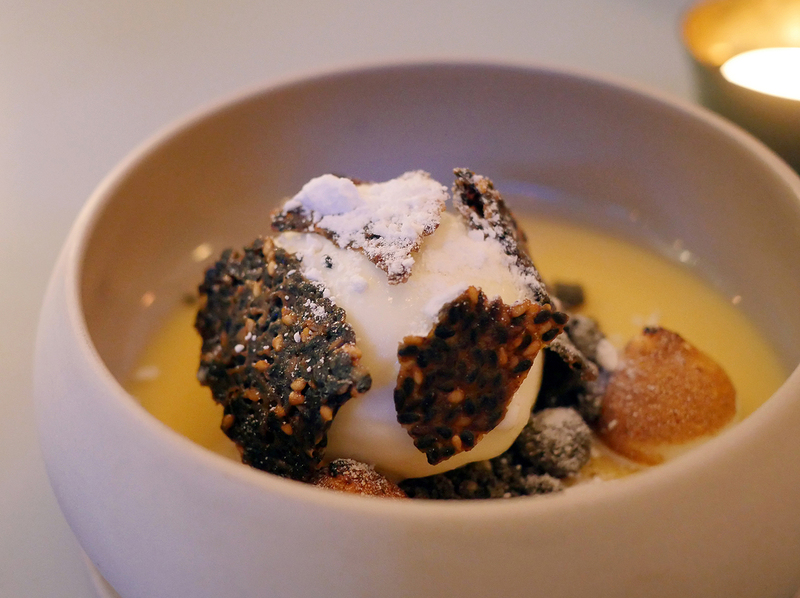 Smooth ice cream, bursting with citrusy tartness, contrasted well with the light panna cotta-style cream and crisp, deeply nutty black sesame wafers. A winning combination. 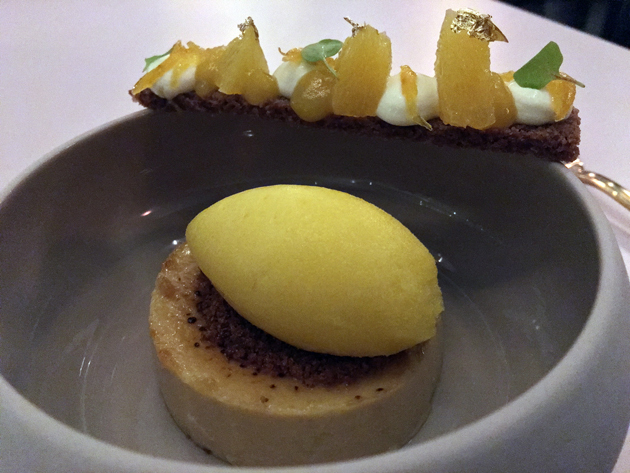 An alternate version of the yuzu tart. There’s no disguising Duddell’s priciness, but if ever there was a spendworthy restaurant then it’s this one. 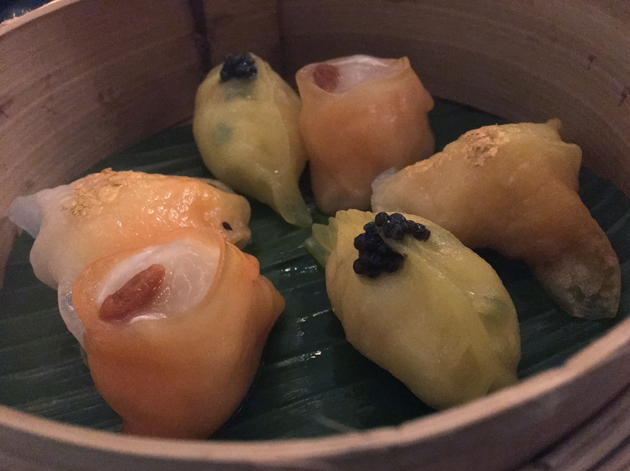 Despite the occasional stumble, possibly due to the somewhat bloated length of its menu, Duddell’s has managed to restore this wizened, cynical old reviewer’s appreciation of Cantonese cuisine. Not through flashiness, gimmicks or trend chasing, but through a fine-tuned balance of vigour, precision and care. What was old is now new again. While there’s still some joy to be found at Duddell’s, it’s now a shadow of its former self mere months after opening and my original review. Laggy service and saggy cooking have brought this once heavenly restaurant crashing back down to earth. It’s by no means bad, but it’s no longer the thrilling, scintillating must-visit it once was and now struggles to justify its high prices. Opening Hours: Monday-Saturday noon-15.00 and 18.00-23.30. Sunday noon-15.00 and 18.00-22.30. Average cost for one person including soft drinks and service charge: £70-80 approx. Tags: beef, char siu, chicken, creme brulee, deep fried, dim sum, duck, duddell's, dumplings, fish, foie gras, lobster, london, macadamia, mango, mapo, noodles, panna cotta, pineapple, pork, restaurant, review, roast duck, sago, soup, squid, stir fry, tart, toast, tofu, turbot, yuzu. Bookmark the permalink.